Wells Fargo Stagecoach Museum - TourGuideTim Reveals San Diego! Features: One of Only 7 Wells Fargo History Museums in the Country; Includes One of the Few Remaining Original Butterfield Stage Coaches. 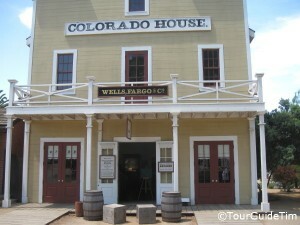 Wells Fargo History Museum Highlights: The Wells Fargo Museum is within the Old Town San Diego Historic State Park. The Park includes a few buildings that are related to the original stagecoach operations in San Diego. This Museum provides a rare glimpse into the story of the Butterfield Overland Mail service and the Wells Fargo Coaches that carried money, mail, and news back-and-forth from the East to the West Coast during the Gold Rush and before the development of transcontinental railways and telegraph lines. Plan on spending up to an hour in the Wells Fargo Museum. Start with the 15 minute video in the back room that explains the history of the Butterfield Stage Coach. A large interactive wall monitor takes visitors on a day-by-day look at the 24 day, 2,800 mile journey on the Buttefield Trail, which traveled from the end of the rail line in St. Louis to the eastern part of San Diego before heading north to San Francisco. (A reconstruction of the Butterfield Station in Vallecito is now a San Diego County Park). In addition to the original Wells Fargo Stagecoach, don’t miss the chance to read through newspapers published in the 1850s and 1860s, as well as look at a 19th century pocket watch, an original telegraph machine, and an original painting of 19th century San Diego. You will also learn about the stagecoach trail that ran from San Antonio to San Diego. Don’t miss out on additional historic Wells Fargo stagecoaches in the Seeley Stables just a block away. Learn more about the Seeley Stables at our page on the Old Town San Diego Historic State Park. Wells Fargo Museum Video – For more on what to expect, watch a short video tour of the stagecoach museum. History of the Wells Fargo Stage Coach – The San Diego Historical Society provides a detailed look at the Wells Fargo operations in Old Town, which started in 1857. You will learn about the stagecoach trails, the agents (some of whose homes are now among the Old Town attractions), and the story behind the antique pocket watch you will see on display at the Museum. Parking – There is free street parking in Old Town. However, many spots limit parking time to 2 or 3 hours. You will also see a number of parking lots on the Old Town State Park Map. The best parking opportunities can be found by driving along Juan Street between the corner with Taylor Street and just north of the corner with Harney Street at the Heritage Park Victorian Village. Overall, the best advice is to take the first available parking spot as you enter Old Town. If you don’t have patience looking for a parking spot, you should take the Trolley. (See Transit below.) On evenings and weekends, you can use the CALTRANS parking lot at 4050 Taylor Street. From here, you will have about a quarter mile walk, including crossing the busy Taylor Street. I don’t know the answer but maybe someone else who comes across this post will. Let’s hope so. I am the author of The Butterfield Messenger book. The book is about the Butterfield Overland Mail ($24.95). The adventure begins with an 18-year old boy from New York City that is hired to be a messenger on the Butterfield Overland Mail stage in Missouri. Over a period of a couple years he worked the stage line on different routes crossing Arkansas, Oklahoma, Texas, New Mexico, Arizona, and California and arrives in San Francisco when the Civil War begins. As you read the book, you will imagine yourself sitting next to the driver for 24-hours or more in brazing hot sun, or a driving rainstorm, maybe in a blinding snowstorm, and it could be freezing cold. Along with the weather, there were hostile Apaches, crossing dangerous rushing rivers, steep mountain roads, and disgruntled passengers that had to get out and push the stage to the top of a pass. And the food was bad with cold beans, crusty cornmeal mush, rancid bacon, roasted beaver tail, raw onions, and wormy crackers. A companion book, The Butterfield Cookbook ($14.95) will teach you to cook 1850s recipes from the Butterfield route. You can purchase both books from the author for $30 postpaid. Send check to: Richard Calhoun, 533 Vandenberg Circle, Roseville, CA 95747. Wholesale prices: 10 Butterfield Messenger $16 each, postpaid and 10 Butterfield Cookbook’s $15 each postpaid.